The key to ensuring a Spin ® bike operates at its best is to keep to a regular maintenance program, regardless of how often you use the bike, and always keeping a careful watch on the bike's regular wear and tear, addressing any small issues that may arise. This way you'll catch any minor issues before they escalate into potential problems. Official Spin ® bikes are designed to work for extended periods of time and meet the needs of multiple users, but they do need regular check-ups to ensure they're running as smoothly as possible. These aren't complicated, and sticking to a schedule is the best way to keep the bikes at their best. Be sure to give your bike a wipe down after each session. Don't use abrasive or oil-based products to do this, a diluted/lite detergent is ideal for the frame of the bike - with a damp cloth being used on the flywheel. Pay particular attention to the bike's chain guard, handlebar, flywheel, the front and back legs, the brake dial, the pins and the leveling feet. Don't attempt to wipe the chain - use a cleaning brush if necessary. After giving the bike a wipe, you can also release the tension from the wheel to allow any perspiration to evaporate from within the bike, and it's a good idea to check the pedals after each session too. It's also recommended that owners keep an eye on the bike's crank arms (it's advisable to use a torque wrench for this particular task) and keep an eye on the screws around the water bottle holder. 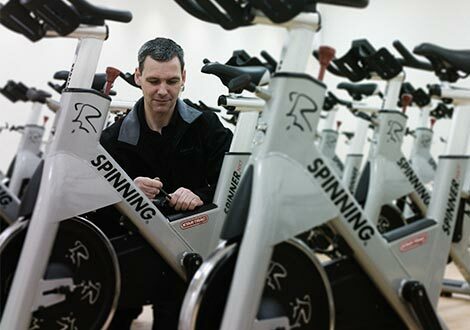 Origin Fitness are experts in Spinning ®, we have a in-house service and maintenance department, so give us a call if you need any spin ® bike advice on 0333 2000 750. This entry was posted in Knowledge & Advice, How-to Guides and tagged spin bikes on 6th June, 2013 by Craig Fleming.